Fitted for Mrs P in Brandwood, this Triton T80 8.5kw surprised her with the superior flow rate over her previous shower. Although they are a multi fit unit they are not always straight forward fit - Extra pipe work may be needed inside the unit but we of course include this with our SUPPLY & FIT price of £199 for the 8.5kw. Fitted today in B30 This Triton Tyne bar shower - see the video below demonstrating the superior flow over cheap entry level bar showers. 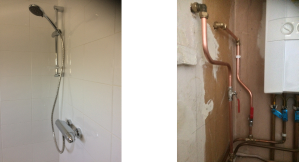 Notice the shower bar was connected to the water supplies using rigid copper tube machine formed also using FULL BORE isolation valves allowing full flow and making maintenance simple. Here we pulled up the hot and cold pipes from under the bath (top left) and continued up into the loft space then across about 2 feet then bringing the pipes back down to this quality Triton bar shower using chrome pipes. We then went on to fit the specifically designed trunking over the supply pipes from the bath to finish off the installation. Time taken around 6 hours. This system works far better than ANY electric shower, for best performance we recommend using with a combi boiler or a pressurised hot water cylinder. 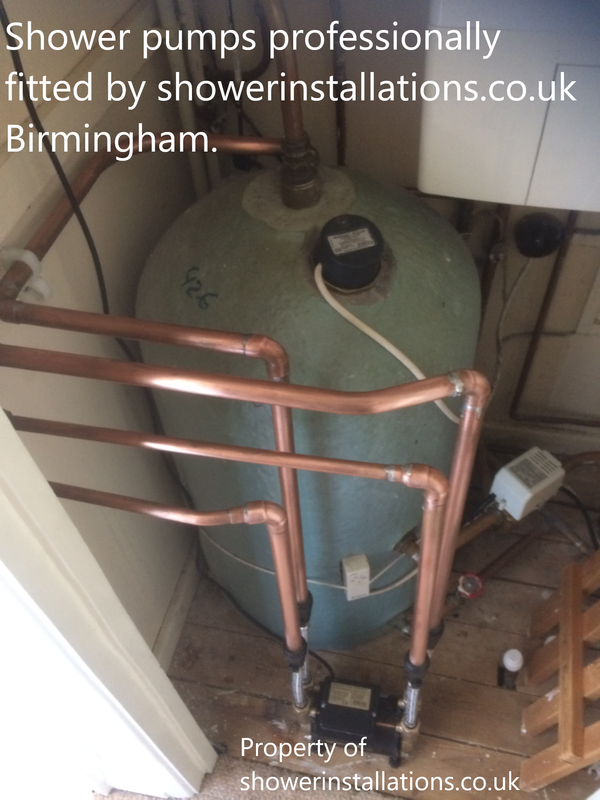 If you have a normal hot water copper cylinder with a cold water tank above in the loft we can still fit for you a quality mixer shower with the addition of a shower pump to boost the performance ! Call us for a no obligation survey and a fixed price quotation. Fitted Today - For our customer in Sutton Coldfield, this Triton Mersey shower bar+ shower pump. The installation took 1.5 days - We got our sparky to utilise the emersion heater switch by upgrading the Mcb. We issue an electrical test certificate with all new electrical installations. The cost for the new bar shower, pump, pipe work, tank & cylinder connections, electrical upgrade and certification around £1150. Call for a survey. 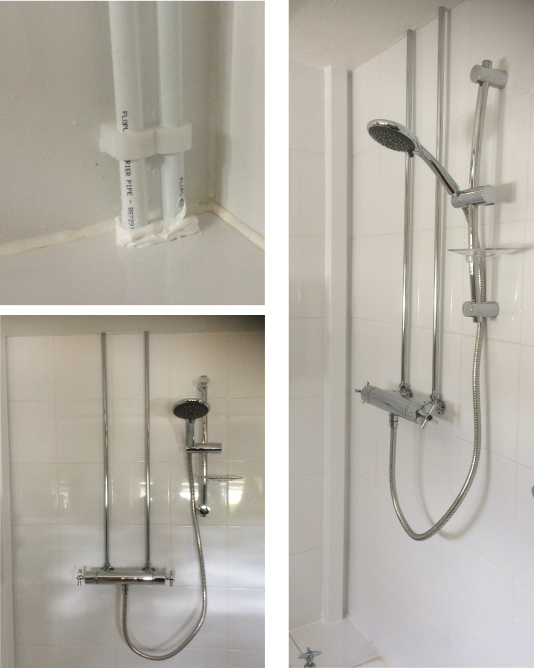 Although more expensive than a new electric shower installation - Our customer recognises this system is far superior in every respect over electric showers. More volume - more even temperature - more reliable - far more classy - Never looks outdated ! - raises the value of your bathroom. Not forgetting if the boiler fails we still have the emersion heater - Treat yourself you are worth it aren’t you ? Although this is a multi fit shower we still had to extend the wiring - We use purpose made crimps and then go on to fit heat shrink insulating sleeves to finish. Note we also included copper pipe extension to make the water connection from the original pipe entry on the right over to the left. 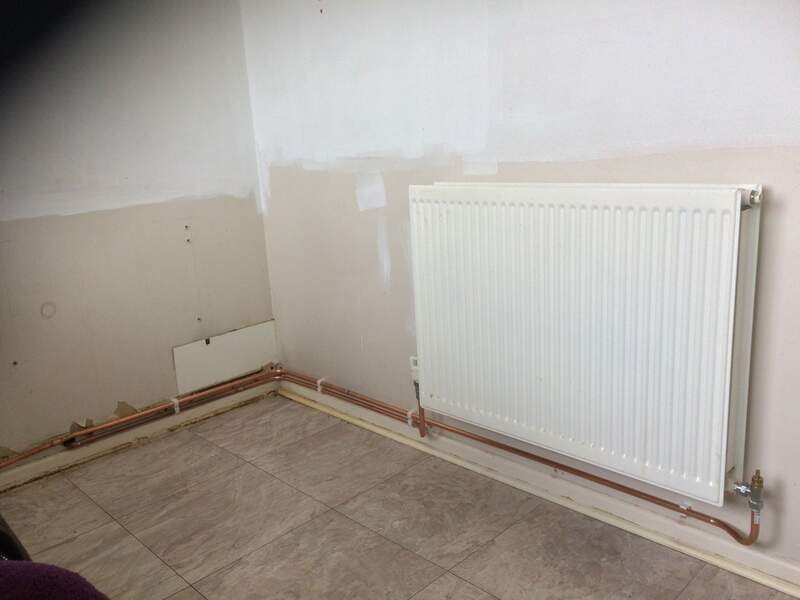 Here we re-sited a radiator in a kitchen diner. 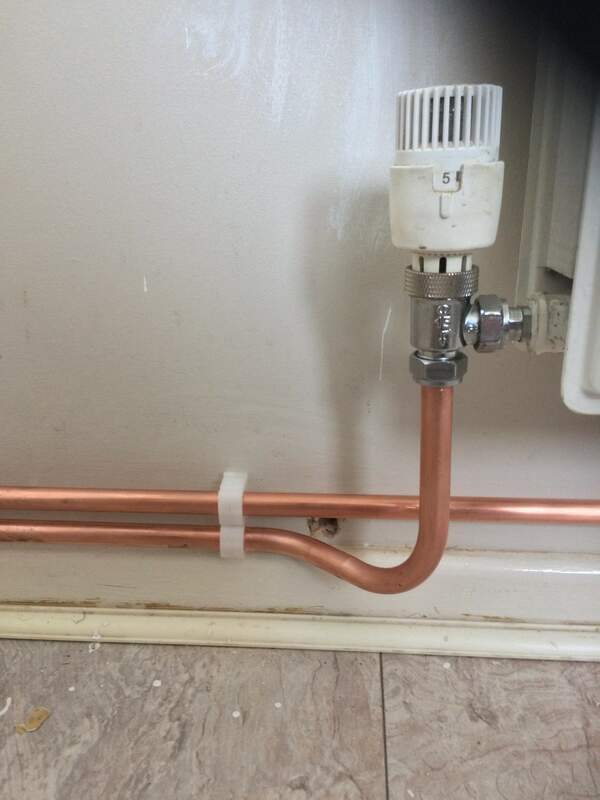 The job took 4 hours to complete with labour and materials the total was £239- Draining part of the system, removing the radiator, refitting to the wall, piping up with proper copper pipe (Note the pipe bends not elbows) refilling the system, bleeding and testing. Click on photos to expand.